Bath Comedy Festival 2012 is our fourth annual celebration of the art of making people laugh. Wow...what a festival! We had a lot of fun, and we hope you did too. There was a huge amount of comedy talent on display this year, with comics ageing from 17 to 77 and shows encompassing many different comedy genres. Sign up to our e-mailing list and visit our Facebook page to keep up to date with news of future events. 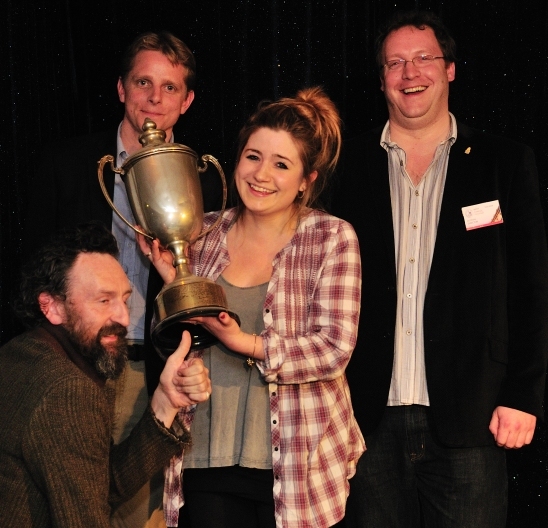 Harriet Kemsley is the winner of the 2012 Bath Comedy Festival New Act competition. Congratulations go to her, and to the runners up - Manos the Greek and Dan McKee. All the finalists received a bag full of Fuller's speciality beers, and winner Harriet receives £200 from the Festival and a holiday courtesy of Fuller's. Pictured left to right are Phil Kay (MC), Henry Franklin (Regional Sales Manager - Fuller Smith & Turner), winner Harriet Kemsley and Nick Steel (Festival Director). Julia Chamberlain (booker for all Highlight clubs UK and producer of So You Think You’re Funny - the biggest annual national new act competition in the UK). Simon Allen (Owner, CAPATAZ FILMS LTD / Motion Pictures and Film - has cast some of the best know TV commercials in the world over the past few years and uses comics more than actors). Geoff Whiting (founder and director of Mirth Control comedy, with 100 UK clubs and 21 others in Europe currently in his portfolio). Bath Chronicle Festival round-up by Ralph Oswick - read here. Venue magazine 4 star review of New Act Competition Final - read here. Venue magazine 4 star review of Jeremy Hardy - read here. Venue magazine review of the first weekend - read here. Guide2Bath review of opening night - read here. The Guardian has picked us as one of the top ten things to do in the UK this Easter. You can read the article here. Venue Magazine have picked their top ten comedy shows from the Festival programme. Read more here. For more features on the Comedy Festival see our press coverage page. We asked some of the comedians performing at Bath Comedy Festival to answer 10 questions in 60 seconds. To sign up to our e-mailing list or view our latest newsletter click here. From Catwoman to Samantha Fox Strip Poker via Frenchie's Slumber Party and Hattie Jacques Bed Bath: the crushes, fantasies and desires of a geeky 80s/90s childhood are explored in a confessional new show by Chippenham's cult storyteller. As heard on Radio 4 and seen on Russell Howard's Good News. Tickets £7 / £5 concs (NUS/unwaged). Easter is a fun-packed weekend full of variety - Kev F Sutherland's Comic Art Masterclass is now sold out, but there's still the Easter Egg Hunt for adults with Arthur Smith, Arnold Letinov's outdoor comedy show, The Scottish Falsetto Sock Puppet Theatre, an Easter eggstravaganza cabaret in Widcombe, Robin Ince at the Rondo, Sal Monello's Hit List showcase of New Act winners, Komedia's Krater nights, Dan Wright at the Assembly Inn, Tom Price at the Comedy Cavern and Easter Sunday lunch with Earl Okin. Phew! What an exciting line-up! On the last day of the Fest - Easter Monday - Natural Theatre Company backstage tours take place at 11.30am, 2.30pm and 4pm and at 7.45pm the New Act Competition comes to its climax with the Grand Final held at Widcombe Social Club, hosted by Phil Kay. Check out the what's on page for full details of all shows. We created YouTube playlists of some of the acts appearing in the Festival - check out the first playlist here. Easter weekend acts - check the playlist out here. Elsewhere there's fast paced fun improvisation at the Rondo with the West Country's own Instant Wit, (more details here). An evening with Jeremy Hardy at Widcombe Social Club is sold out - sorry. There are a few tickets left to be snapped up for Barry Cryer & Ronnie Golden at Widcombe Social Club on Thursday - click here for details. Elsewhere on Thursday Quicksilver perform at the Rondo, Revolver's free Bound & Gagged night at The Common Room features Tom Glover, Welsh Dan & Stuart Newport, and the last of the New Act Competition heats features 7 more up and coming comedians at the Baroque Comedy Cavern for just £5 entry. Well done to Bob who spotted the error, who receives a £1 prize! Tickets for Robin Ince on the evening of Friday 6th April are £14 / £10 concs, apologies for any confusion. Prices on the web site and at the box offices are all correct - see the what's on events diary for details of all shows. Venue rated Bath Comedy Festival number 1 Comedy pick, and a top favourite thing to do this month - see the press coverage page for more. Tonight at Widcombe Social Club we've got the one and only Piff The Magic Dragon - Come and help him save his species! 6.30pm doors for 7pm show - Click here for details. After that The Real MacGuffins are in town and host an evening of sketches and stand-up with Matt Green and Gary Colman. Doors open at 7.30pm for an 8pm show. Full info here. Also, the Krater Comedy Club at Komedia has the wonderful Steve Williams, with support from Pierre Hollins, Steve Hall and MC: Sally-Anne Hayward. Details here. Check out the what's on page for the rest of the diary - there's something for everyone in our best ever programme! The Festival officially kicks off today, with an eclectic cabaret at Widcombe Social Club starring Mik Artistik's Ego Trip, Alan Francis, Clovis Van Darkhelm and Jared Hardy. Doors open at 7.30pm for an 8pm show. Click here for details. Also today, the Bizarre Bath comedy walk is back for the season - meet outside the Huntsman at 8pm. Click here for more info. With two shows already sold out, tickets are selling fast for Bath Comedy Festival events. "Tickets are selling faster than ever this year. We all need a laugh in this recession, and humour is the best defence mechanism against the hardships over which we have no control - the best way to beat the banking blues! "There are many laughs to be had this Festival, so make sure you book your tickets early to avoid disappointment!" The Festival officially starts tomorrow, but if you can't wait til then why not go to see the first heat of the New Act Competition - tonight at the Comedy Cavern at Baroque Nightclub? 7 acts - Tom Glover, Isaac Lee, Alex Perry, Paul Laight, Manos the Greek, John Pendal, Christopher Turner, Eddy Brown plus MC Dan Thomas - all for just a fiver, and that includes free entry to the nightclub too. Tickets can be purchased on the door at the venue. This year's Comedy Festival came a step nearer this week as the printed programme hit the streets. 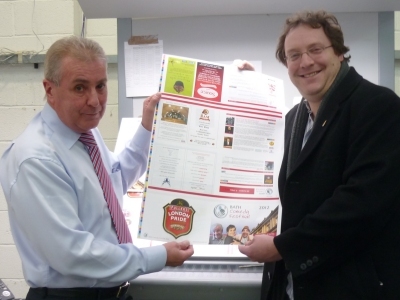 Photo: Martin Russell of MDP Ltd and Nick Steel with pages from the new programme. Festival Director Nick Steel says: "The programme looks fantastic – thanks to MDP again for their excellent quality printing. The line-up this year is fantastic too – we've got everything going, from up and coming new acts to famous favourites, something for everyone with shows of every imaginable style!" The latest addition to the Festival is the Up The Pump Room Ball - on opening night there is a grand black tie Charity Ball at the Pump Room and Roman Baths which will include dancing to the strains of a fabulous German orchestra from Stuttgart, specially flown in for you delight and delectation. More. This year's shows are all now on sale - see the what's on page for details. 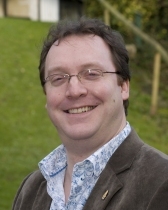 Nick Steel reports: "I'm very proud of the programme - at classic comedy venue Widcombe Social Club there will be 15 shows over 11 days, starring a host of well known names like Barry Cryer and Jeremy Hardy, some highly unusual cabarets and the popular Sunday Lunch shows with great musical comedy on the side. "Look out for local favourites like Jarred Christmas (yes, that chap with the big sideburns), Chippenham's fabulous fast-talking raconteur Wil Hodgson and Bristol's up-and-coming star Jared Hardy, plus "Show Me The Funny" winner Patrick Monahan, German Comedy Ambassador Henning Wehn, and the one and only Piff the Magic Dragon. "Musical comedy will be provided by Mik Artistik's Ego Trip, Bill Smarme & The Bizness, Earl Okin and those darlings of the London cabaret circuit The Segue Sisters, who will be starring in an Easter Eggstravaganza Cabaret hosted by Arthur Smith. "There's a run of events at the Rondo Theatre starring amongst others Robin Ince and Mitch Benn, and shows all over town including the Mission Theatre, Komedia, Bath Central Library, the Assembly Inn, Ye Olde Farmhouse, and not least the brand new Comedy Cavern at Baroque nightclub, which will be host to the New Act Competition heats as well as their regular Sunday evening shows. "The Natural Youth Theatre will be entertaining on the streets on April Fool's Day, and festival stalwart Arthur Smith is returning to lead a grown-ups' Easter Egg Hunt... There are workshops led by Women on the Make and Tony Allen, and something for the kids too with a comic art masterclass where everyone goes home with their very own comic! . "This year's Bath Comedy Festival line-up truly has something for everyone - stand-up, street theatre, sketch comedy, story telling, character comedy, comic art, cabaret, music, magic, mystery tours, walks, workshops and puppetry...and that's just the classifiable stuff!" Bath Comedy Festival has once again been shortlisted for the Arts Award in the Bath Life Awards 2012. The ceremony will take place at the Bath Assembly Rooms on 23rd February. Thank you to everyone who nominated us! The 2011 archive web site including archived news and press coverage is still available here. © Copyright 2012 Bath International Comedy Festival Limited. All rights reserved.